La Casa in Chianti accommodations reside in a typical Chianti Classico farmhouse from the XI century, perhaps even further back to the times of the Romans and Etruscan that lived in the area. It is divided into two vacation rental villas for families and friends on an adventure in Tuscany. Surrounded by a beautiful garden, a green olive grove and a large pool, the rental villa and self catering apartments find themselves in a most picturesque environment. Here you can relax in the silence of the countryside, eat outside on the scenic terraces and enjoy an authentic Tuscan holiday. 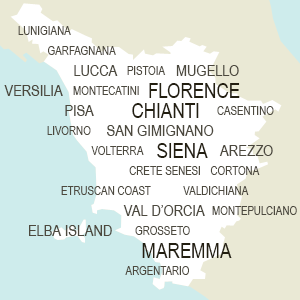 The countryside position offers the best of Tuscany, while providing easy access to many major sites and cities. From La Casa in Chianti you can explore Siena and Florence, go wine tasting in Chianti, Val d'Orcia and near Arezzo and you can enjoy the many small towns with their cobbled stone vias and weekly markets. The evocative setting of Chianti Classico and the beautifully restored antique farmhouse in Gaiole presents an enticing invitation to explore the beauty of the landscape, the culture and the wines of Tuscany at La Casa in Chianti. The family run villa rental and the self catering apartment provide a tranquil base for exploring the historic legends, Etruscan tombs and medieval villages that abound in the area. The accommodations can be divided into seperate apartments as described below or the whole property can be rented as one vacation villa for 12 persons. By capturing special details during the restoration of the farmhouse, the owner has created an atmosphere of comfort with studied pieces of the past. The massive wooden beams, the smooth terracotta tiles, and the classical rustic furnishings are accented by neutral colors mirroring the landscape and sculptured stone walls. La Casa in Chianti represents a typical Tuscan setting featuring many modern accessories and comforts. Choose between two possible holiday accommodation solutions at La Casa in Chianti near Gaiole, among the vineyards and olive groves. The Ulivo villa features a spacious floor plan of 200 square meters and is divided into 3 bedrooms, 3 bathrooms, a kitchen, a study, dining room and separate living room with a cosy fireplace. The kitchen is super spacious and features a dishwasher, toaster, coffee makers, and all the basics for preparing hearty Tuscan meals. The panoramic terrace overlooks the breathtaking landscape of Chianti Classico vineyards. The interior is tastefully decorated in soft Tuscan colors, attractive antique furniture and curious accents highlights the brick arches and wrought iron fixtures. The Fico villa has been carved out of the completely renovated barn and is suited for up to 6 persons. The villa is set all on one floor and is comprised of 3 bedrooms, 3 bathrooms, a living room and a fully equipped kitchen. Loaded with extras, it is ideal for a large family with both a dishwasher and washing machine. Boasting suggestive views, and easy access to the 6 x 12 meter swimming pool, you will also find a terrace with pergola, perfect for lounging, or a picnic dinner under the stars. The spectacular views from the many terraces, well maintained garden and panoramic pool will hardly encourage you to explore the many wonders of Tuscany. However, when you choose to stay at La Casa in Chianti the opportunities abound! Stay close to home and you can visit the local vineyards for some wine tasting, stroll the closeby little towns like that of Gaiole, or San Gusmè or grab a bike and follow the white dirt roads of Eroica. There are a million photo opportunities, small restaurants with genuine menus and local markets with fresh ingredients to recreate your favorite pasta dish. If you are looking to admire the architectural and artistic wonders of the area, go no further than Siena with its amazing Piazza del Campo, tall brick towers and marble churches. The roads are easy to navigate taking you to discover the beauty of small cities like that of Arezzo with its nationally acclaimed antique market and Cortona, with is many little shops, pubs, museums and busy cultural scene. Head north to Florence and its internationally renowned masterpieces or south to Montepulciano and its award winning cantinas and wines.